There’s a scene in the movie version of Under the Tuscan Sun where Frances, having decided to pick one room at a time in her new Italian villa and make it her own, begins with her writing desk. She turns it so that she can look out the window while she works, and decorates it with pretty boxes, and bouquets of both pens and flowers. While I enjoyed the movie, for what it was, that scene really resonates with me, because I’m the same way about my writing desk. Oh, I can’t always afford to keep fresh flowers on it, but whenever I can, there they are, and even though I tend to compose everything I write at the computer keyboard these days, I have to have paper. Real paper. I have baskets of blank note cards and piles of post-its, and while none of them are about my anniversary, if someone gave me such a pad, I’d laugh delightedly, and add them to the stack. Post-its are great for jotting down notes, and the one thing I hate about no longer working in the corporate world is that I no longer get post-its for free from various vendors. The post-it notes are just one reason I’m digging this great web-shop that specializes in wedding anniversary gifts, Just Paper Roses. Not only do they have a selection of faux flowers designed for every anniversary, in both artsy and “lifelike” versions, but they also have post-its, picnic-ware, teddy bears, and lots of other cool gifts for anniversaries, birthdays, and just because. One of the items I thought was cool was that for the 10th wedding anniversary gifts, which are supposed to be aluminum, they offer metallic roses in a shiny aluminum vase, that should look tacky, but instead feels sort of retro-chic. In fact, if my next wedding anniversary wasn’t going to be my 16th, I’d be asking Fuzzy to get it for me, to put on the desk in the Word Lounge. When I was a little girl, my grandmother used to give me the tiny square booklet-calendars she got free from the florist or the bank, or wherever. 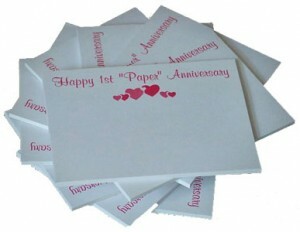 I always got a kick out of reading the list of anniversary gift themes. You know, first year, paper, and all that. I’m guessing the folks at Just Paper Roses liked those calendars too, because their products suit every taste from serious to silly, and their prices are reasonable. One of my favorite books is a tiny missive by Alexandra Stoddard called Gift of a Letter, that basically talks about how letter-writing is becoming a lost art. I’m a die-hard letter writer. I’m also a die-hard lover of flowers, but I have many friends who feel sad about sending cut flowers because they don’t last. As you can imagine, I’ll be turning them on to the fabulous silk and paper roses Just Paper Roses offers. Well, just as soon as I place a bouquet on the corner of my writing desk, light some incense, and sit down to write to them about it.